According to the Consumer Price Index (CPI) food prices across America are set to increase by between 4-5 % - a figure that's well ahead of inflation. It's easy to understand that prices will rise but what exactly does this mean for the cost of regular everyday items. How much will a carton of milk cost? How much will a loaf of bread set you back? 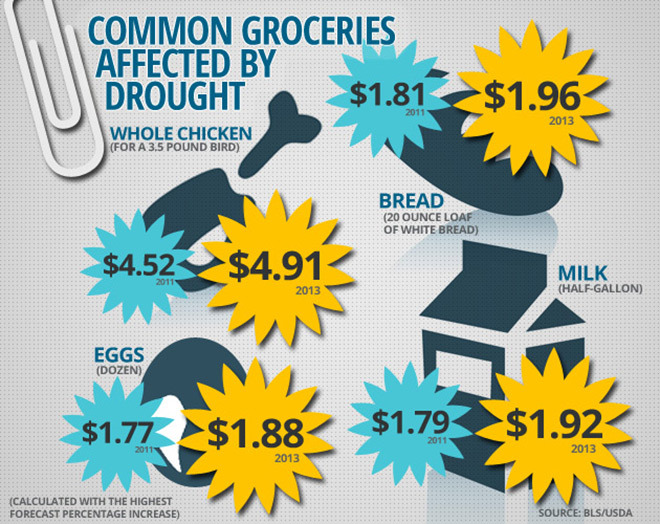 The team at the Climate Desk have created this useful infographic that predicts what certain food items could cost in 2013 if the CPI's predictions are true.